The original idea of having a bilingual Lodge, that is, a Lodge able to hold its ceremonies in Welsh or English was the brain child of one brother who wanted to improve his Welsh. A committee of like-minded brethren was formed and soon the wheels were put into motion to achieve this aim. The English ritual was translated into Welsh and before long a demonstration team had formed capable of performing the ceremonies in Welsh. In October 1982 Penybont Lodge, No 6743 became the sponsoring Lodge and therefore our mother Lodge. Thus Cyfrinfa Dewi Sant was born and consecrated on March 1st 1983. There were 27 Founder members. From 1983 to 2006, the ceremonies were held, in Maesteg. It was felt, however, due to the diverse areas from which the members had to travel, that Bridgend would be a more convenient venue. Hence, from 2006 to date the Bridgend Masonic Temple has been Dewi Sant’s home. Always wishing to improve itself, in 2007 the ritual in Welsh was completely revised and is now regularly used within the Lodge. In 2012 the Lodge designed and purchased a Banner which was dedicated by the Provincial Grand Master in a most impressive ceremony. The hard work put in initially by the founders and continued by the membership had come to fruition galvanising the Lodge under its own banner. 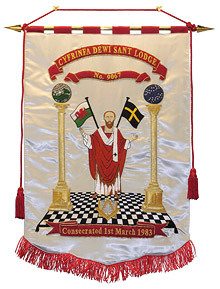 Dewi Sant Lodge, No 9067 has existed for 32 years. It is a very friendly Lodge and is keen to encourage other like-minded persons to join the ranks of this very special and indeed unique Lodge in Wales.